You could choose to solely post content on your own website and wait for the visitors to come (emphasis on the word “wait”). Or you could choose to be more assertive and proactive with your brand by publishing high-quality, unique content both on and off your website via article writing, guest blog writing, column writing, and more. Publishing content on a trusted platform helps you build exposure, enhance credibility, increase connectivity, and foster authority. Combine these great benefits together and you’ll have packaged your platform into a reliable brand that will drive highly-targeted traffic back to your blog or website. Take these great benefits a step further by helping yourself to the advantages and prestige you gain from publishing: share your Expert Author status by adding your EzineArticles Expert Author Banner to your website. Here’s why: You have a limited time to catch the attention of your readers and to hurdle their skepticism. Readers want the best information to meet their needs, so they’re going to go with the source who has the credentials that are transparent and easily verified. 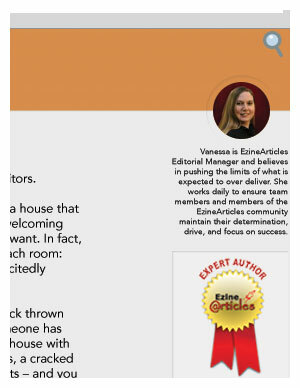 EzineArticles’ Expert Author Banners serve as a badge of prestige symbolizing your credibility. Whether visitors choose to click your Expert Author Banner to view (and verify) your EzineArticles Expert Author profile or not, you’ll have earned their trust. And their trust combined with your originality and a dash of credibility is what gets conversions, engagement, and traffic. There’s nothing to it. All it takes is a few minutes of your time (or your web designer’s time) to easily build trust, credibility, and traffic. Add your EzineArticles Expert Author Banner to your website today! Too bad I’m not a new author lol. I know my facebook friends and customers would like to see more acclaim from me. I think the Author Banner will help me to do just that. Win-Win proposition for Author and your site. Expert author status will not bring money or I can not buy bread with that. I think posting the EzineArticles author banner on your site or blog can greatly boost your credibility. In most niches, visitors and followers of your’s who see an EzineArticles banner on your site will perceive you in high regard. It can only help you and your credibility. Very Good, I do Believe that Making Articles on Trusted Platforms like EzineArticles work a lot on bringing targeted traffic. There is no doubt that articles posted on trusted article distribution websites are great ways too get exposure and get traffic to your website. The very reason why authors should endeavor to diversify the platform where they post their articles rather than “putting all their eggs in one basket”. There are tens of good and high PR free article submission websites out there authors should take advantage of. Simply Google “free article submission websites” and you will find them. A great and helpful insight. I created my account at EzineArticles and hired a writer. How do I make sure I found a writer that complies with EzineArticles? Another tip would be to verify and ensure the content is 100% original prior to submission. Hope this helps! I have found it very helpful. “will you submit an article to EzineArticles.com if there was no search engines?? Answer yourself. If you get the answer that “you are submitting an article to EzineArticles.com, only for back-link value to boost search engine ranking, then you are violating google guide line. I have added the expert author banner in my blog. I have one doubt.After my article is published here,can I use the same article to post in my blog? You’re welcome to post your articles on your blog if you wish. That is totally up to you. One thing we recommend when republishing your articles elsewhere is to ensure the same author name is used across all platforms so there is no confusion when it comes to ownership. 1- Can it affect my main site if I post those same articles in my other blogs and link to it? 2- Is the author name enough when republishing my articles? Should I use any kind of a link to the author to avoid search engines banning? Really appreciate another insight of publishing / posting on articles in the EzineArticles arena. Hoping to learn more about the quality of required content and how it affect my ranking.